There are certain experiences that are exclusive to Hay. Settling down to watch Tina Brown, the legendary journalist and editor, Harold Evans (who also happens to be Mr Tina Brown) sat down in front of me, their son grabbed the seat next to me with his sister in front. James Naughtie then strolled past and shook Harry’s hand before re-emerging on stage in the role of William Boot. Watching one of the world’s greatest live interviewers in full flow is pleasure enough but when the interviewee is someone with the experience, intelligence and foresight of Tina Brown then it is an hour to be cherished. Nothing disappointed. 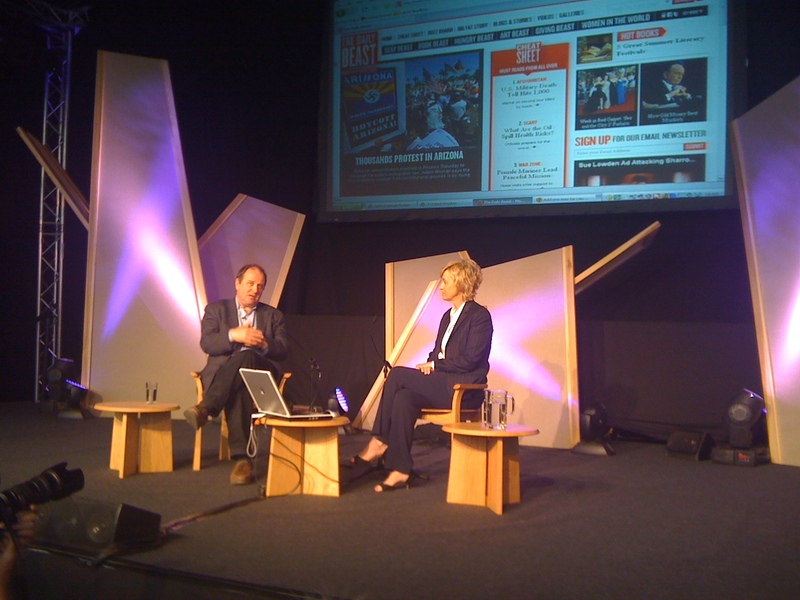 The journalist, author of The Diana Chronicles, and former editor of Tatler, Vanity Fair and The New Yorker was there in the main to talk about ‘The Daily Beast’ her online news and opinion site. As a digital immigrant, as her husband’s nemesis Rupert Murdoch might have put it, she is fluent in the language. Though on the subject of News International she cast doubt over the current pay wall experiment because of the fact that newspapers have for so long allowed their content to be consumed for free. “The horse has bolted”. The iPad is on order and ‘The Daily Beast” will be added to my favourites.